I hope everyone is having a fantastic start to the week. I have been busy prepping for a new job (YAY!) and also helping my Mom get ready for our big Thanksgiving meal on Thursday! I am SO excited that Thanksgiving is only THREE days away, and that Black Friday shopping/sales are coming up right after! Speaking of, I am working on some gift guides and also a Black Friday/Cyber Monday shopping guide as well! I love polling y'all on Instagram and appreciate all the feedback for what you're looking for in terms of shopping. Excited to share that later this week! Ok so on to this casual holiday look. Speaking of polling on Instagram, 66% of y'all voted that you would like to see some casual holiday looks (whereas 34% voted for dressy holiday looks!). I will try to incorporate both in the next few weeks but tonight I wanted to share this look that would be ideal for a casual look on either Thanksgiving Day or for Christmas. I mean you can't go wrong with a red sweater for Christmas. One of my favorite tips for sweaters is to go up a size (I am wearing a size medium here) for a looser fit, that you can wear over leggings! 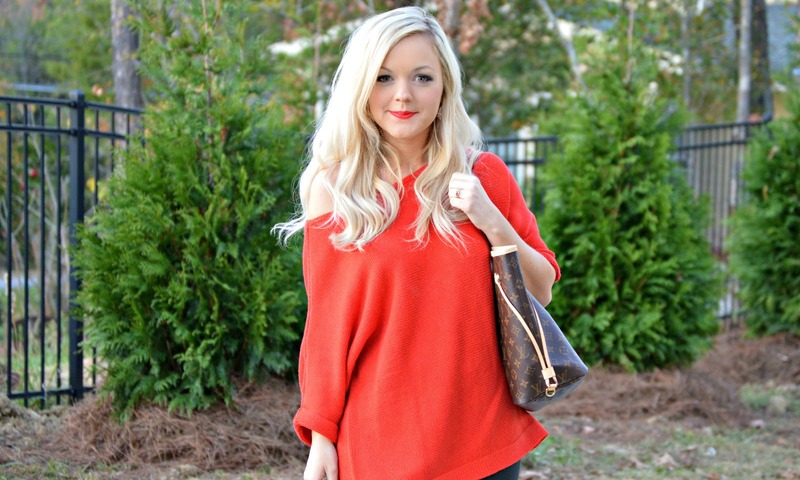 I also love that this sweater fits off-the-shoulder if you go up a size! 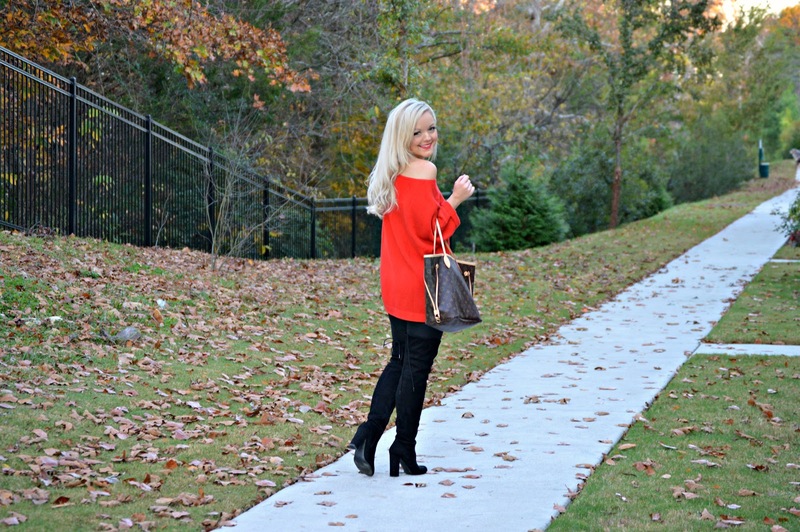 I paired my sweater with some of my favorite faux leather leggings that are just under $27! To top of my look, I added my favorite OTK boots from Target...these are seriously the perfect designer dupes for the Stuart Weitzman pair that retail for over $700. I am eyeing the taupe pair next! You could also easily wear flat boots with this look, but I decided while it is "casual" I wanted to dress it up a tiny bit with my OTK heeled boots. This look would be perfect for a Christmas dinner at your family's house. What is YOUR favorite holiday style!? Leave me a comment and let me know, and stay tuned for some super exciting SALES!!! !